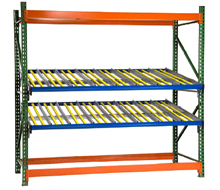 Conveniently convert standard 8' slotted pallet rack into flow rack with the addition of flow rack shelves that have lanes configured to match carton size. Flow shelves simply lock into support clips mounted to inside slots on pallet rack uprights, providing stability and easy flow angle re-positioning without having to remove the flow shelf. You don't need pallet rack beams to support these flow shelves. Each flow shelf has its own sturdy cross member supports as well as front and rear beams for excellent weight capacity per lane. For greater flow control, add guide rails to keep cartons from bumping adjacent lanes and jamming the flow pattern. Plan 1 guide less than total number of lanes per shelf when purchasing guide rails.